Durable and high-performing, the VersaLink C600/DX Color Laser Printer from Xerox will dramatically improve efficiency and productivity in your office. 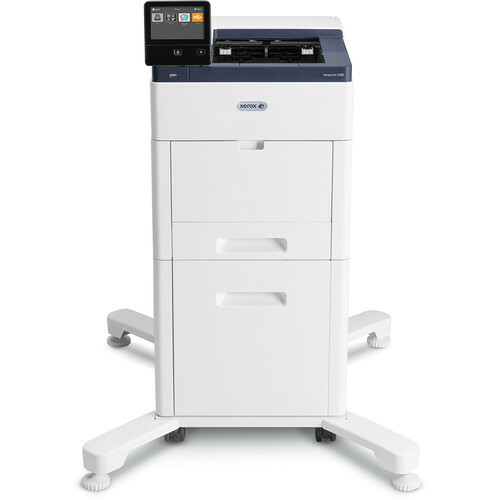 Capable of full-color printing at speeds up to 55 ppm and with a first print out time of just 8 seconds, you won't have to wait to get your documents ready to go. Automatic duplexing is standard as well for two-sided printing in order to save paper. And, with built-in Ethernet and NFC Tap-to-Pair functionality, users can print directly from their mobile device via various protocols. This model offers a variety of media handling options, making it suitable for both specialized jobs and high-volume operations. This includes the standard 150-sheet bypass tray for media from 3 x 5" up to 8.5 x 14" and a 550-sheet tray for media up to 8.5 x 14". Along with this the C600/DX includes a 2000-sheet high-capacity feeder for letter and A4 media for large jobs. For reliability, the C600 features an impressive monthly duty cycle of 120,000 pages. Setup and operation of the printer is made easy through the implementation of a large 5" color touchscreen on the front control panel. Also, a front-side USB port supports direct printing from portable flash drives. Additionally, USB 3.0 connectivity is available alongside Ethernet for simple wired setups. Color laser printing technology offers the ability to produce high-resolution graphics and text at up to 1200 x 2400 dpi. Users will enjoy speedy printing with a maximum printing rate of 55 ppm in simplex and 52 ppm in duplex. The first print can be made in just 8 seconds. Automatic duplexing is available for quickly producing two-sided documents and saving paper. Standard print features include application defaults, bi-direction real-time status, booklet creation, draft mode, job identification, job monitoring, personal print, print from USB, sample set, saved job, scaling, secure print, skip blank pages, store and recall driver settings, two-sided printing, and Xerox Earth Smart driver settings. A front-facing USB port supports walk-up printing from a portable storage device using PDF, JPEG, TIFF, or XPS file formats. Print directly from a mobile device via Apple AirPrint, Google Cloud Print, Xerox Print Service Plug-In for Android, or Mopria-certified devices. A 150-sheet bypass tray will work with a range of media types ranging in size from 3 x 5" up to 8.5 x 14"
Standard is a 550-sheet input tray for media from 3 x 7.5" to 8.5 x 14" for most jobs. Large volume printing will benefit from the inclusion of a 2000-sheet high-capacity feeder that works with letter and A4-size media. One optional 550-sheet tray can be installed if extra capacity is desired. Paper types supported include bond, plain, cardstock, hole-punched, labels, letterhead, lightweight cardstock, heavyweight cardstock, pre-printing, recycled, and custom. An advanced 5" color touchscreen is present for intuitive operation and clear view of settings and status. This unit will warm up in about 11 seconds from sleep and boot up from off in 52 seconds. USB 3.0 and Ethernet connections are available for standard wired setups and networking. For wireless operation, NFC Tap-to-Pair technology enables devices to directly communicate and set up connections by simply placing them in close proximity to one another. The built-in font library includes 136 PostScript fonts and 83 PCL fonts. Advanced device management and accounting options are available for tracking and controlling printers remotely. Numerous security features and encryption options are standard for ensuring data is kept safe. VersaLink C600/DX Color Laser Printer is rated 3.6 out of 5 by 5. Rated 1 out of 5 by mac27 from requires full time tech dept on site We got the versalink c600dn because we wanted a fast printer. But we have spent approx 14 hours just setting the machine up and it still jams every time we try to print an envelope. If you have an unlimited budget and have a technical person onsite 24/7 it may be a great machine. For a small office, much to complex. It's fast and the print quality is excellent but the setup for each print job is not worth it. Rated 3 out of 5 by PRINTER-USER from Finally some FASTER printers that do not weigh a TON-seems like xerox is attempting to bring out some faster printer for once, instead of slow pokes! I will start off by saying this is a slow improvement on there new line of printers, not sure why there latest printers are still slow at printing.. 55ppm isn't slow, but I know xerox can make faster printers, we need 65ppm and faster! , But I am somewhat impressed that the weight of these new printers are heading into the right direction, its hard to find a fast printing printer under 100lbs. The C600 weighs in at 64.8lbs!. I was disappointed in the print quality, most of or all of the xerox printers always had a nice shine or gloss to the printed output, but the C600 produces a DULL look to it,, I returned it for this reason. paper handling seems ok, I did not test envelopes. The web interface is annoying, looks like some TODDLER designed it, every time you update or refresh the web page it turns BLACK with this silly spinning circle that makes you DIZZY! its really annoying! I hope future printers get rid of that BLACK background and spinning nightmare of a circle in the middle of the webpage, what were you thinking XEROX!! ONE last thing and for GOD sake xerox, get RID of those stupid silly plastic clips that you use to seal the boxes with, either one or a few of them end up missing when the box arrives, that is NOT a good seal, anyone can tamper with the product while in transit, someone can remove the plastic clips, there are usually 1 on each side of the box, and tamper with the product, remove toner, etc, and close the box and put those plastic clips back on and one would never know that anything was tampered with!! Rated 5 out of 5 by Bandwatcher from Great for looking at products in color We use this to see a rendering of an artists idea of what a uniform in all of it's color will be. Allows us to work with customers with the same colors as provided. Rated 4 out of 5 by kNAPPER from Fast and easy to use We bought this machine to print large Specification books for Architectural projects.. It has been a huge upgrade to our other office printers. Rated 5 out of 5 by Cowboy22 from Quality, Speed & Supply Cost Savings The very best Xerox printer yet. Quality is superb and fast. Cost savings on ink vs other printers will make a large difference. Quiet running.